HOW DO I SET UP A PROFESSIONAL OR WHOLESALE ACCOUNT? Snow Lotus offers several types of accounts for those who qualify. Please review the policies below to determine which type will work best for you. Please contact us if you have any questions, as we are unable to issue credits or refunds retroactively. •Professional/Practitioner account: 15% discount off retail prices for health-care professionals. There are no minimums required for opening orders and reorders using the Professional discount. Please create an account online to open a Professional account and email us to let us know that you have created the account so that we can update your discount. •Wholesale account: 40% off retail prices if not purchasing a display; 50% discount off retail with purchase of a display. A Wholesale account is designed for retail sales. All new Wholesale accounts require a resale license or tax ID number, an opening order minimum of $250 and a reorder minimum of $100. If choosing a 50% Wholesale account, please list which testers you would like; we offer 12 free testers per display tier per year. Again, we require all this information in an email. You will receive a confirmation showing that we are processing your account/order. CAN I PLACE MY WHOLESALE OR PROFESSIONAL ACCOUNT ORDER ON THE WEBSITE? Yes, you can. However, all opening orders must be placed via email and paid for by credit card. Subsequent orders may be placed online once you have registered your account online and had it verified by the Snow Lotus office. If ordering Wholesale, please make sure all re-orders meet the $100 minimum (not including the shipping charge) when ordering online! Sorry, but no refunds or credits can be given for Wholesale orders placed online before Wholesale account set-up and approval. 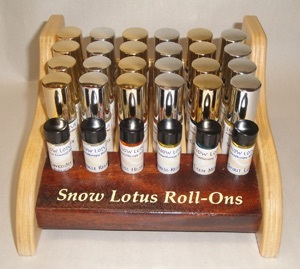 WHAT DISPLAY OPTIONS DOES SNOW LOTUS OFFER FOR WHOLESALE 50% ACCOUNTS? Choose one, two or three of the following beautiful handcrafted tiers, made of pure pinewood. These are specially made for us based on our bottle size and design requirements. 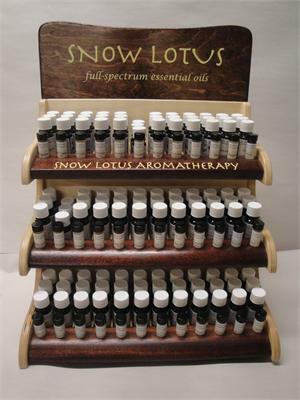 Our Snow Lotus Aromatherapy display consists of 1 - 3 tiers (racks) that nicely stack on top of each other. Each tier holds 3 each of 12 different oils or blends of your choice. Total dimensions of a 3-tier display are 14.5" wide x 9.5" deep x 19" tall (including the header board). Tier pricing includes 4 ml testers at the front, but not the actual oils. We offer 12 free testers per year for each tier. I HAVE A PROFESSIONAL OR WHOLESALE ACCOUNT: DO I GET A DISCOUNT ON SEMINARS? 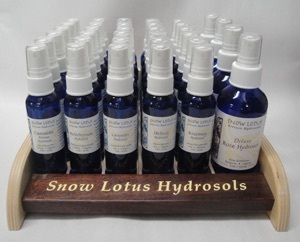 Snow Lotus Seminars are services offered separately from Snow Lotus Aromatherapy and its products. Snow Lotus Seminars offers an early-bird and buddy rate registration discount on many of the seminars and workshops offered. We also offer beautiful matching displays for hydrosols, facial serums and roll-ons. Please be aware that these do not qualify as a tier to open a Wholesale account; however they do make an excellent accompaniment to the main display. The Hydrosol display holds 5 2 oz hydrosol misters across and 6 deep. There is also one slot for our 4 oz Deluxe Rose Hydrosol that holds 4 deep. The Roll-On display holds six 6 ml roll-ons across and four deep. 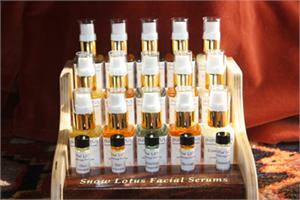 Our Facial Serum display is an excellent way to showcase our fabulous Revitalizing Facial Serums.